5 star graded. 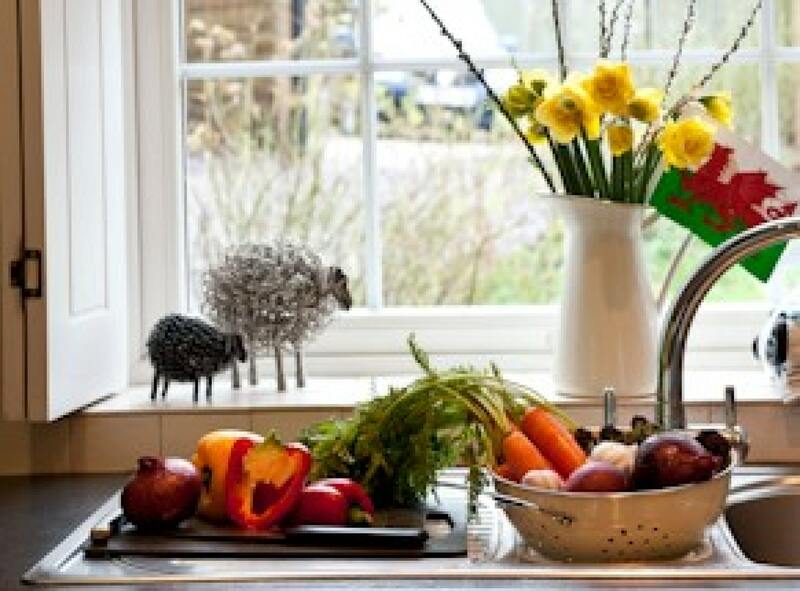 The proud winner of the Best Self Catering Place to Stay in Wales 2010 and 2018. Winner of Best Visitor Welcome 2015 and numerous other awards. 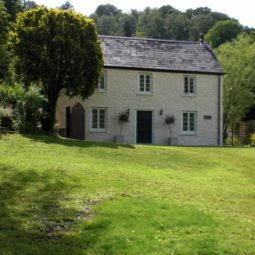 The cottage directly adjoins the Wye Valley Walk, and the Monmouthshire Way, is in the heart of the ancient conservation area of Tintern and there are several pubs, a couple of small cafes and two busy hotels in easy strolling distance -all offering food and several featuring local produce. The village even has a prizewinning vineyard and a microbrewery both open to visitors! Also in the village are a craft centre and vintage book shop. 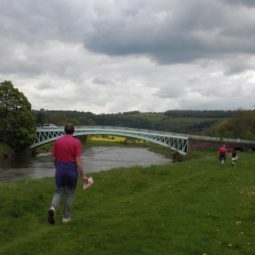 There’s a bus stop at the bottom of our drive so you could walk along the wonderful Wye Valley or visit Chepstow Castle or Racecourse and get a bus back . 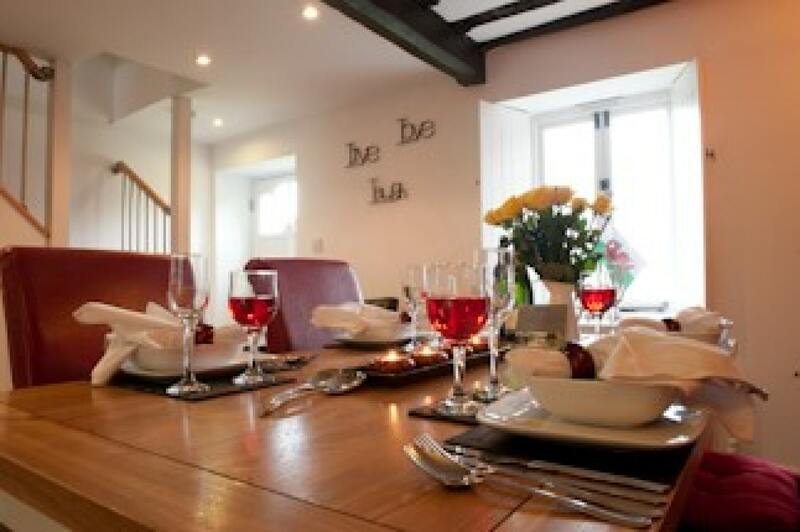 Importantly, we are walking distance of the Church ( the functioning one) and several hotels plus the Old Station with wedding licences – so ideal for the bridal party to stay or for wedding guests. The village is a popular tourist destination and particularly in summer is busy with everything from morris dancers and folk bands to cricket matches, coach tours, festivals, music, weddings and numerous other events taking place. Its nevertheless surprising that when the closing bell rings at the Abbey peace returns. 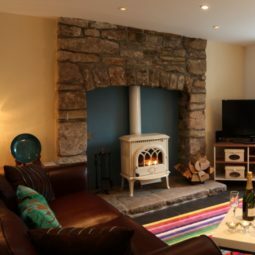 This cottage is often chosen for reunions,honeymoons, and significant birthdays by couples requiring a little extra space. 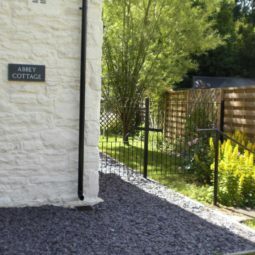 Tintern Abbey Cottage is a family holiday favourite ( lots to do locally including numerous family orientated attractions, plenty of sporty things to interest active older children , major sports events in Cardiff, and geocaching, the WiFi , are hits with teens) . 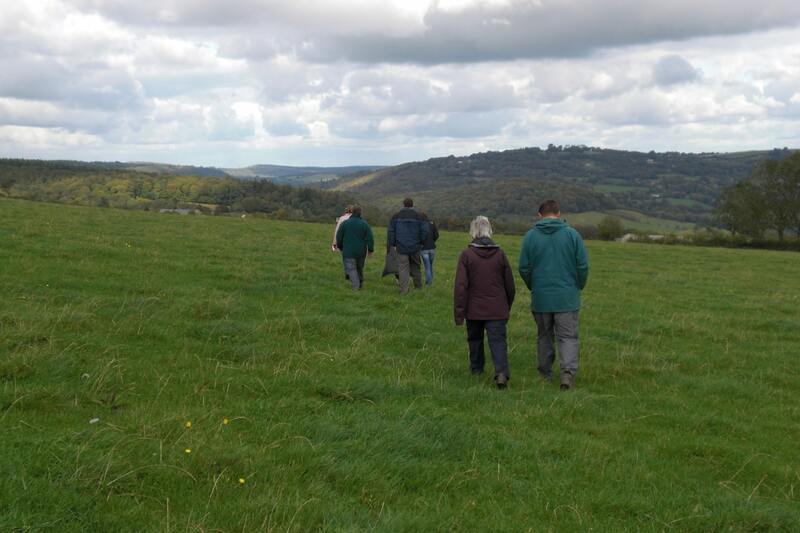 We have many walkers ( every walk from easy lanes to canalside to open mountain within reach within about an hour ). 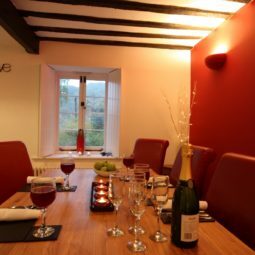 Tintern Abbey Cottage is very popular for family reunions , significant birthdays and anniveraries, and chosen by professional couples wanting a little extra space for a honeymoon or just to relax. Film crew and professional performers come too . 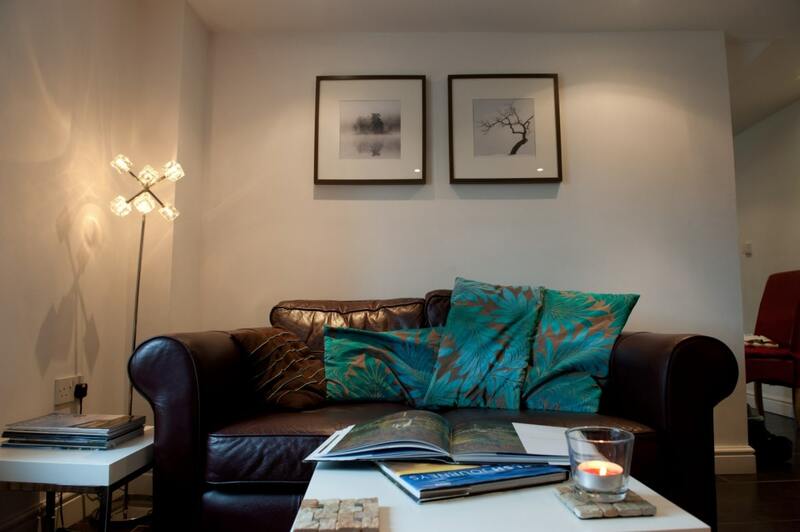 All people who want comfort, location and civilised convenience. 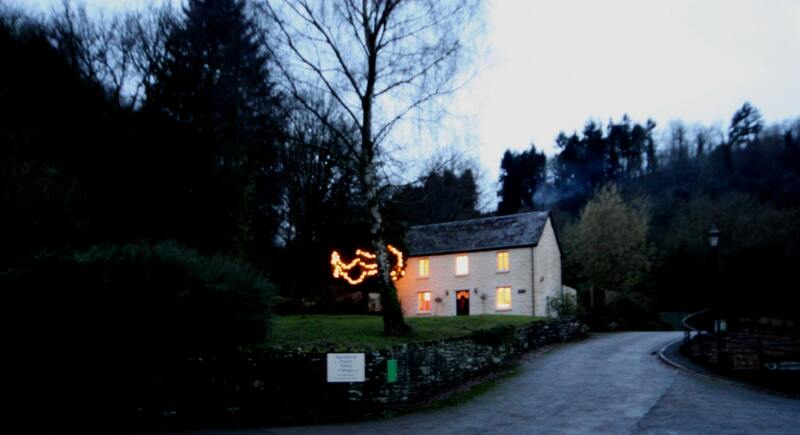 Village location, walking distance to pubs, eateries and village events. 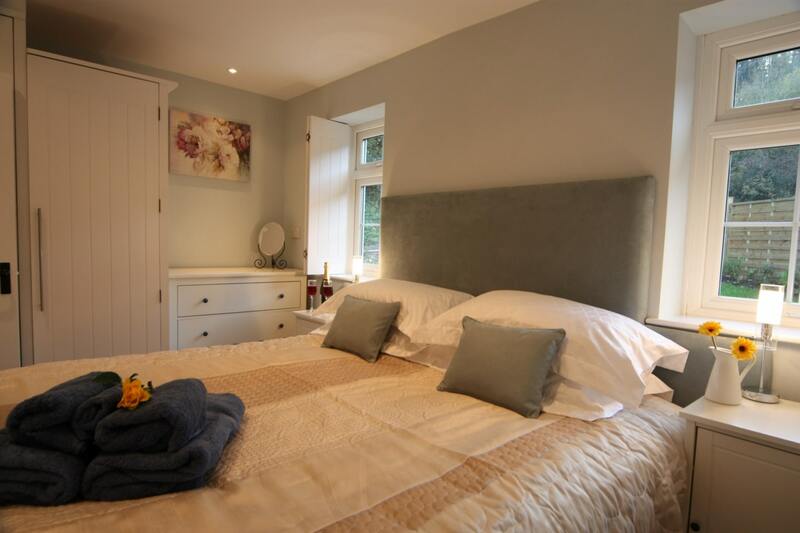 3 double bedrooms – all with superking 6ft beds which convert to twin beds on request. Infant’s travel cot (linen not provided), nursery fireguard, portable baby gate ,highchair all available free of charge on request. 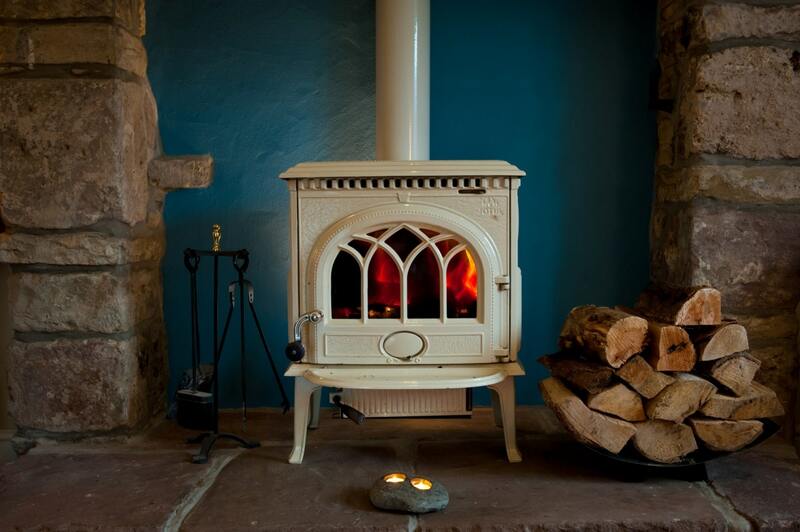 Cosy wood-burning stove and full central heating included ,thermostatic valves, double glazing. 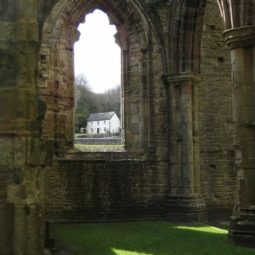 The cottage is within the original walls of the Abbey precinct grounds. (The listed wall still runs round the woodland next to the garden). 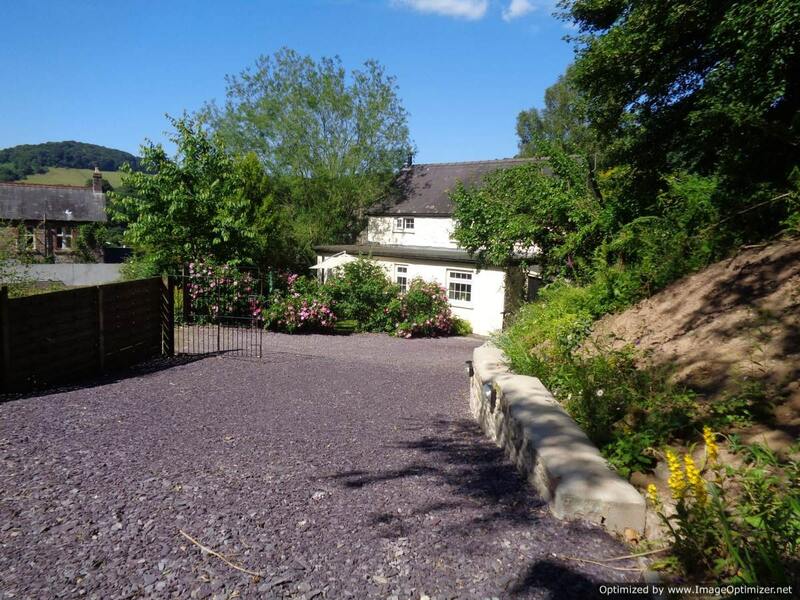 Detached, it stands in its own spacious garden back from the road (which was built for stagecoaches ) and has full frontal views of spectacular Tintern Abbey. 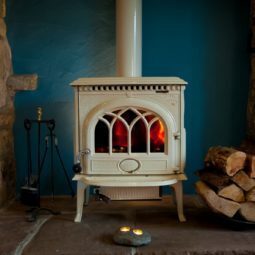 Together with its thick stone walls and double glazing this keeps it quiet indoors despite its convenient village location. 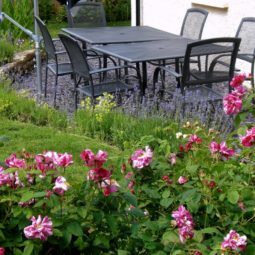 The front garden is sloping and unfenced due to the view and the conservation area.The rear garden is fully fenced and catches the afternoon sun so this is where the terrace with table and chairs is located. Within the village there are several cafes, pubs, restaurants and hotels so plenty of places to eat and drink without driving. One cafe sells basics such as eggs and milk. There is also an antiquarian bookshop and a craft centre. 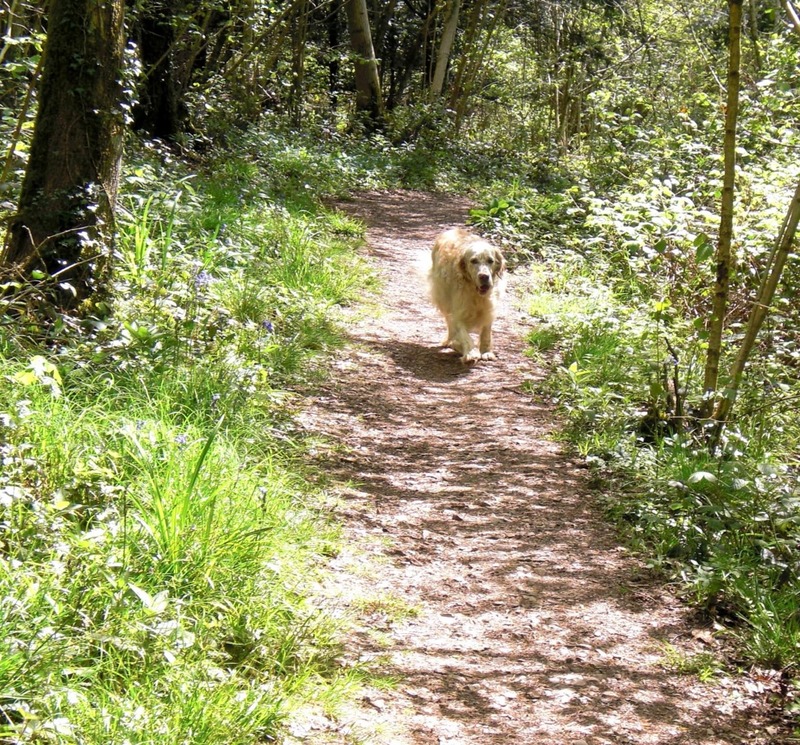 Walking is amazing from the doorstep with both woodland and riverbank trails. 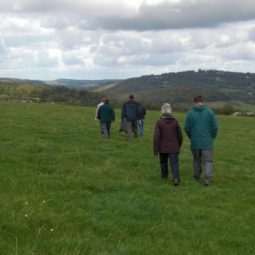 Offas Dyke, the Wye Valley walk,the Monmouthshire Way, Tintern Trail, all pass through the village. The village boasts a prizewinning vineyard and a brewery which have regular opening times and are worth a visit. Hic. 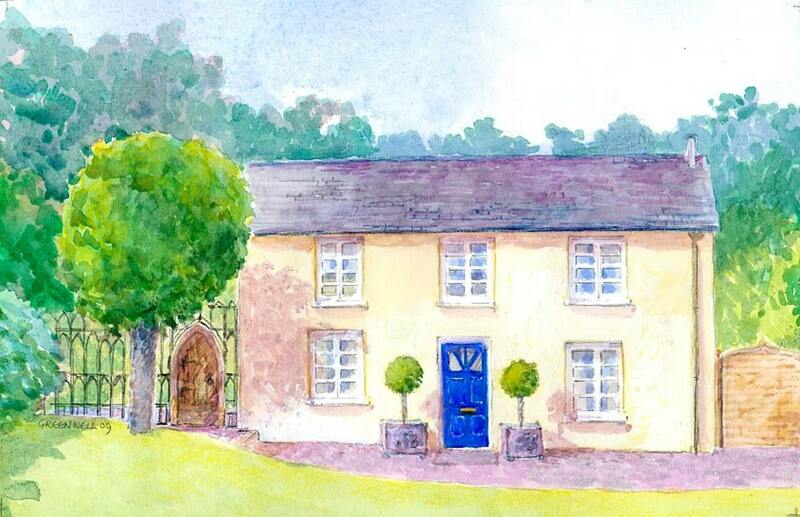 There are regular buses to Chepstow and Monmouth from close to the bottom of our drive. These make it possible to take a bus and walk back along the riverbank. On summer weekends the village becomes busy with lots of events such as jumble sales, a good fete, a produce show , cricket matches, morris dancers etc and films are shown at the Village Hall once a month nearly all year. . .Visitors are always welcome. 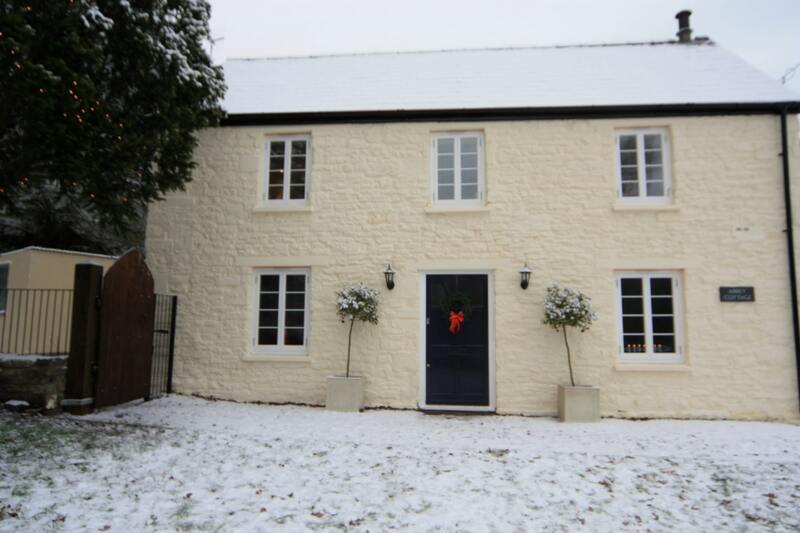 Nearest full town facilities such as bank, supermarket, vet, are approx 5 miles ( Chepstow). Adjacent to the cottage is the Abbey Hotel closed down since 2014. It is subject to a long drawn out planning application. 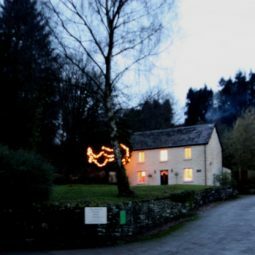 Apart from its poor appearance (though its not visible from the cottage itself) there has been no effect on the cottage guests . 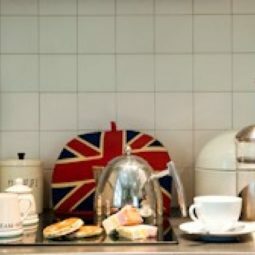 If and when this is to change we will advise booked guests- so no need to worry. All bedrooms have their own flatscreen TV s with DVD players. Three Radio alarm clocks/ipod docks. Cards, indoor and outdoor games, magazines, books DVDs to borrow. 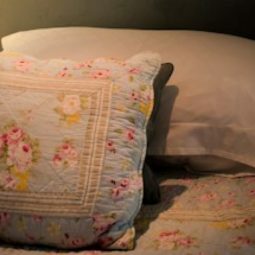 Bed linen- freshly laundered Egyptian cottons, low-allergy fluffy duvets and pillows. NOTE We are aware of planned roadworks on the A466 Wye Valley Road in spring 2019 . These will affect your journey and your SATNAV will not take account of them! Please print and use these suggestions! From London,the South or South West of England and Southern Wales.- see also note below about road works between Chepstow St Arvans and Tintern. Continue straight over St Lawrences ( hospital) and pass useful Budgens shop on left .At Chepstow racecourse roundabouts ( Roundabout 3) go straight on in direction of Tintern. 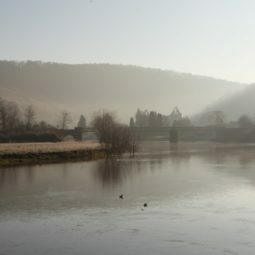 (About 6 miles from Bridge to Tintern.) Straight on past the racecourse keeping track home straight walls on your right. At St Arvans village follow the main road right and then round a series of bends, you will now start to glimpse the River Wye on your right. 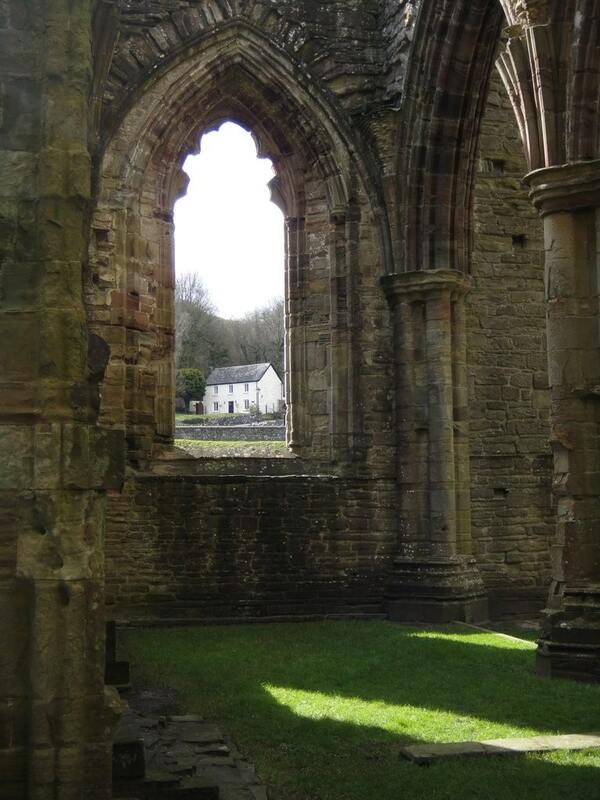 Continue to village of Tintern. Beware speed restrictions. They are enforced. 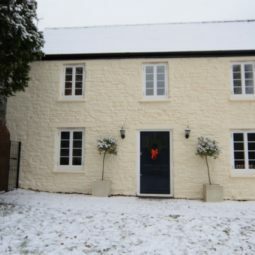 The cottage is clotted cream colour and its drive is the very first driveway off to the left on entering the village after the speed signs. You will most clearly see the signs for the( closed down) Abbey Hotel. Turn left up the drive between the hotel and the cottage. Note that some SATNAVs send you up the tiny lane behind the closed Abbey Hotel ( entering near the Royal George and arriving behind the cottage). This is not wrong but its awkward and unecessary. Stick to the main road till you see the cottage and come up the drive next to it!! Drive up and behind the cottage and you will see our gated driveway. Access is through the BACK door down two steps near the garage. It has a code box. There is no key. From the North Recommended route from Midlands and East Anglia also. NB Monmouth is at the junction of three rivers. Careful which bridges we are talking about !! Straight on half mile to traffic lights at bridge over River Wye. 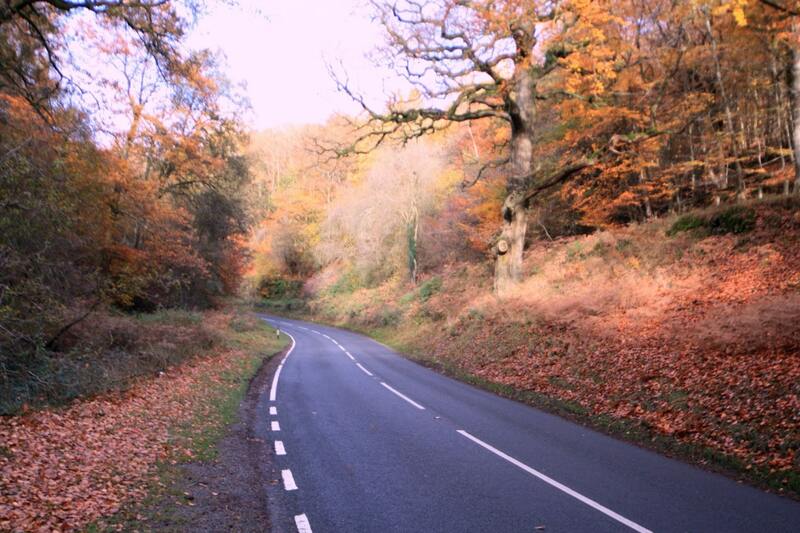 Continue along this A466 Wye Valley scenic road for approx 10 miles. Beware of speed traps at Redbrook. Beware also of drivers enjoying the scenery and not watching the bends!. They do cause nasty accidents on this road. You will cross the “international frontier” (a river bridge with traffic lights at Bigsweir you are now entering Wales. Croeso! ) and then pass though Llandogo. Note Browns shop on right hand side which is a tardis and has most daily needs. 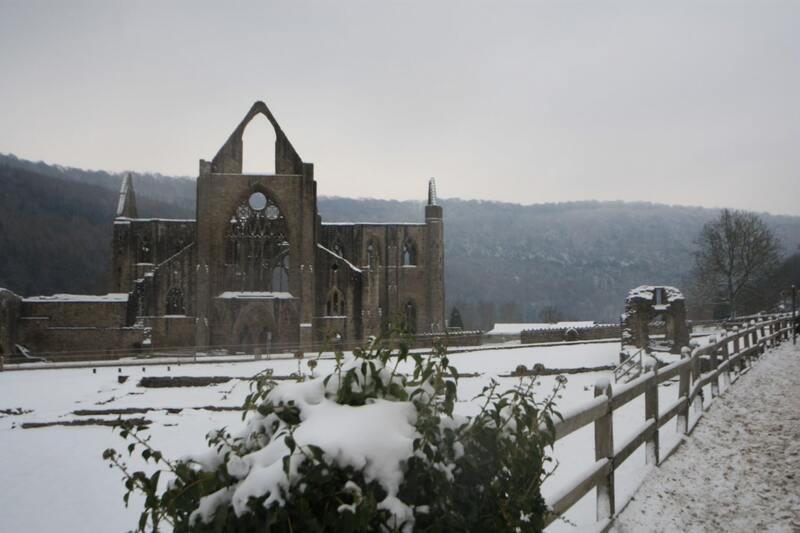 Continue into Tintern. 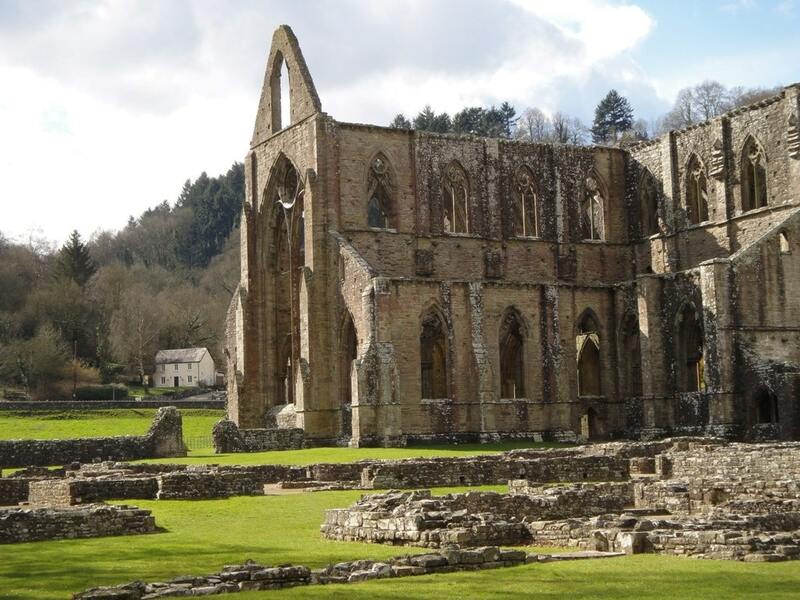 If you are early you may like to turn left into Tintern Old Station where you can walk your dog and Easter school holidays to end of October half term there are good toilets and a prizewinning cafe. (Note that some SatNavs will try to take you over to the Abbey. This is wrong. Access is through the BACK door down two steps near the garage. It has a code box and opens with the code we have given you. There is no key. At the time of writing the damaged area has traffic lights which have next to no effect on your journey however we have heard that in spring 2019 the road will again be completely closed and diversions will be in place. We are advised that the work will start 8 May and the road will be closed for 7 weeks . At St Arvans village look for the Piercefield pub. After the pub is a stone fountain and a left turn signed Devauden, Trellech. .Take this left turn and uphill. Continue about 1.8 miles to a wooded area. Take a narrow right hand turn signed Tintern and the Cot for 1.5 miles Its a narrow downhill lane which will wind down and pass Ravensnest fishery on your right and bring you to fish ponds. 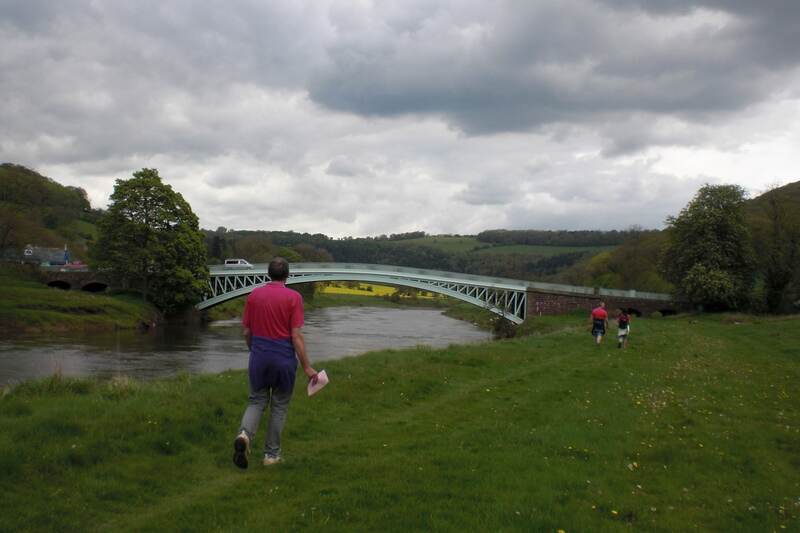 (This area is called Pontysaison which means Saxons Bridge and was the site of an important battle with saxons) . You need to go straight on downhill following the Angiddy river and you can do this by driving either side of the ponds. (So either cross the first bridge on your right and then go left , this is a narrower option OR keep left not crossing the bridge, pass houses on your left and take first right alongside pond and then bridge on right.) 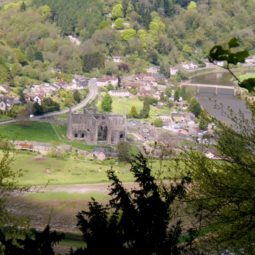 Pass the ancient ironworks site on your left and keep going downhill and into Tintern rejoining the A466 and the River Wye at the Royal George Hotel. Turn right. 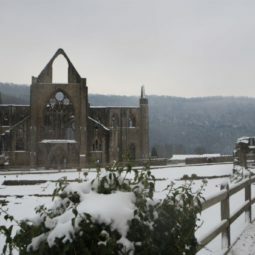 You will see the Abbey on your left and shortly afterwards you will see our drive on your right .Tintern Abbey Cottage is the very last building in the village on your right. Dual carriageway to Monmouth roundabout ( theres only one.) Straight on half mile to traffic lights at bridge over River Wye. Straight over at lights, do not cross river Wye, get into left lane. 300 yards to next exit left signed Rockfield and Trellech BEFORE TUNNELS . . At exit turn left up Beech Road, 300 yards. Turn left at top of Beech Road . ( If you want to pick up food the easiest option is to turn right at this point, over road bridge and left at Garage. Right across River Monnow bridge into cattle market where there is a Waitrose open most nights till 8. and pedestrian access to High St with other shops including M and S Food. . 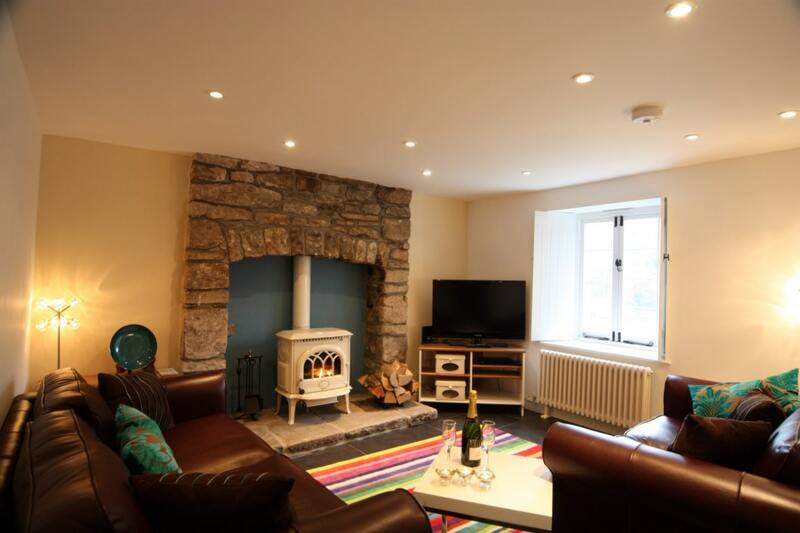 Yes, cottage has fridge, freezer ,microwave , oven with grill After shopping retrace steps and…..
From town or from North all now continue from bridge above tunnels and petrol station garage . On entering the village of Trellech be very careful at STEEP bends round churchyard. Pass Lion pub (food) on left continue through village and after 250 yards or so -take next left exit. IMMEDIATELY LEFT AGAIN (round Spring Villa ) onto the Llandogo Road. 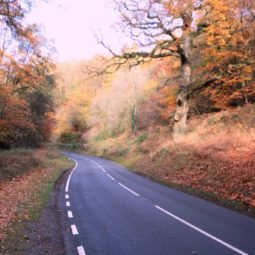 Continue a couple of miles along this winding road until road slopes very slightly downhill and there is a Forestry Commission Car Park ( Whitestone) on your left, Turn right signed Tintern here. 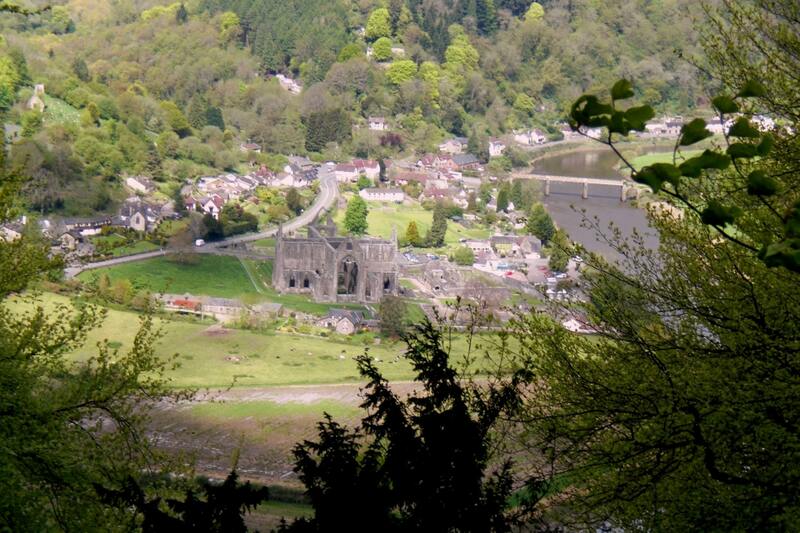 Continue downhill all the way into Tintern arriving on the main A466 with the Wye Valley Hotel on your left. Turn right and go right through village passing Tintern Abbey on your left. . Cottage is the last building on the right hand side before leaving Tintern. 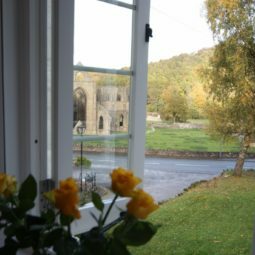 In 2009 we bought the Tintern Abbey Cottage and undertook a total renovation to conserve its 250 year old slate and stone heritage and create a “smart new house in a wonderful old body – and with a million dollar view”. 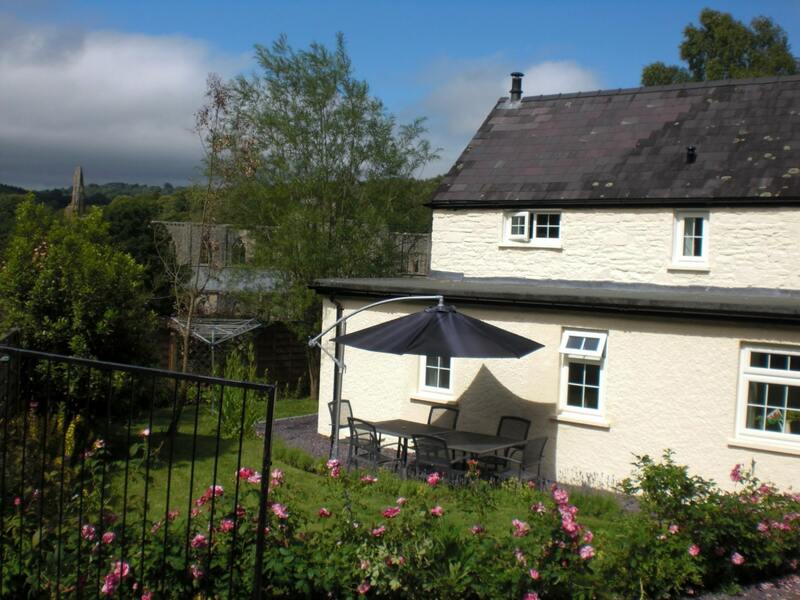 It was immediately awarded its five star status and within months won the Best in Wales Award. Come see! 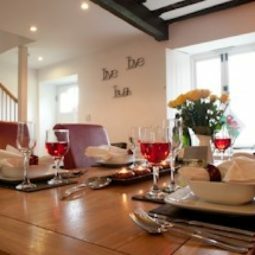 Originating from the 18th century, Tintern Abbey Cottage is chocolate box cute and has been transformed into a smartly contemporary and deliciously comfortable holiday house in an ancient body. 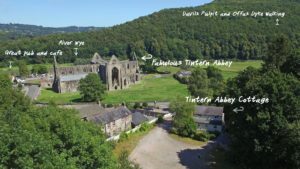 Right across the road from the mighty roofless Abbey, of which it has glorious panoramic views, the photos show how amazingly close we are to it! 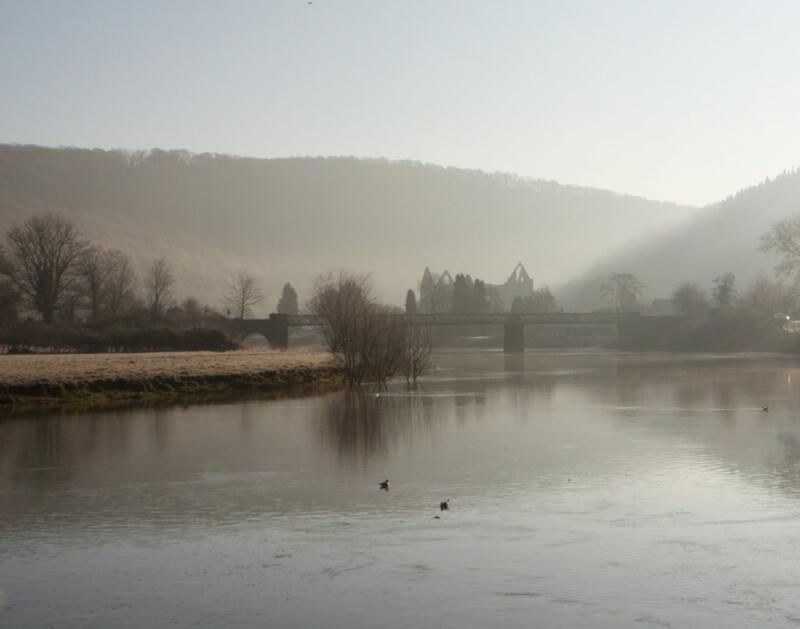 The cottage directly adjoins the Wye Valley Walk, is in the heart of the ancient conservation area of Tintern and there are several pubs a couple of small cafes and two busy hotels in easy strolling distance -all offering food and several featuring local produce. The village even has a prizewinning vineyard and a microbrewery both open to visitors! Also in the village are a craft centre and vintage book shop. There’s a bus stop at the bottom of our drive so you could walk along the wonderful Wye Valley or visit Chepstow Castle or Racecourse and get a bus back . The village is a popular tourist destination and particularly in summer is busy with everything from Morris dancers to cricket matches, coach tours, festivals, folk music, weddings and numerous other events taking place. Its nevertheless suprising that when the closing bell rngs at the Abbey peace returns. 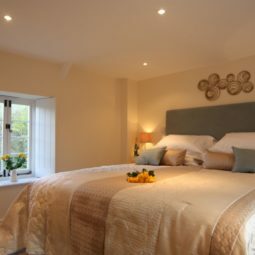 It sleeps 6 and has three bedrooms with superking ( 6 feet wide) beds which can each become a pair of 3 ft twin beds on request. One of the bedrooms is spacious the others are standard size original cottage rooms (and as in the 18thCentury beds were not 6 feet across, as ours are, there is less spare space in those two rooms!) . 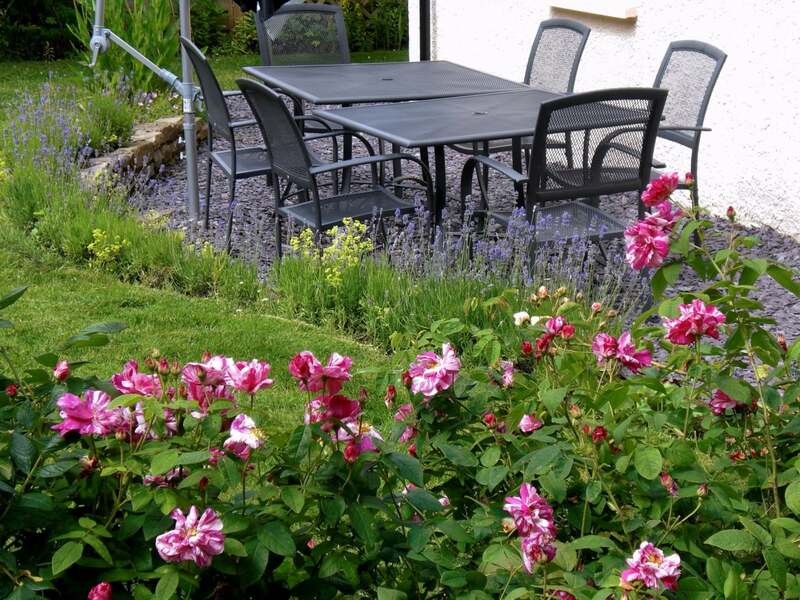 sheltered and fenced garden with furniture, private off road parking. 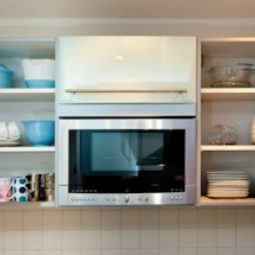 A very full inventory including many extras , combined with modern basics like double glazing , excellent insulation, and a green central heating system go without saying. If you would like to know more about anything specifically please ask us. This cottage is also often chosen for honeymoons, reunions, and significant birthdays and by by couples requiring a little extra space. Please scroll down to see lots of pictures and just ask us if you need to know more. 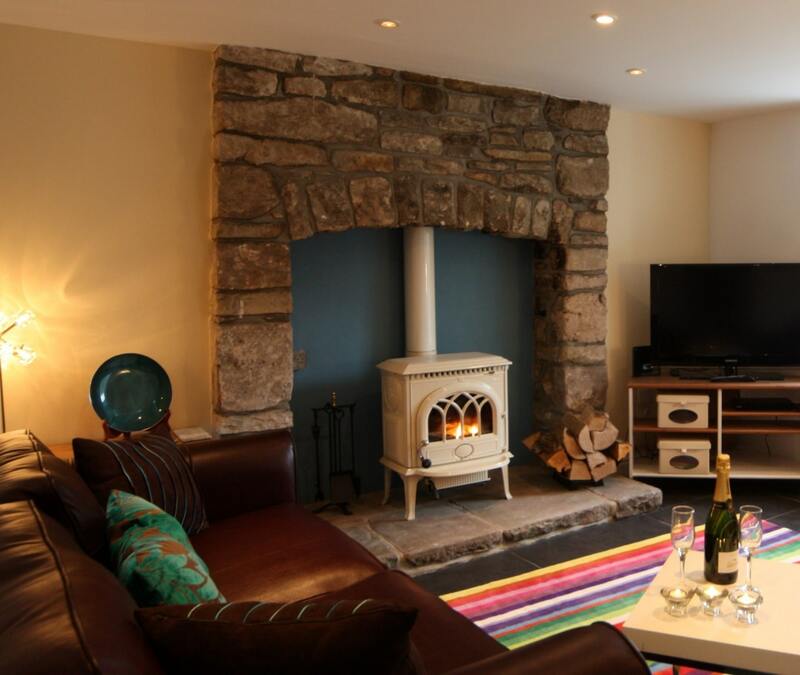 Tintern Abbey Cottage has a warmly comfortable sitting room with slate type floor, rug, woodburner and flatscreen TV, as delightful on a summers evening as for opening your Christmas parcels. 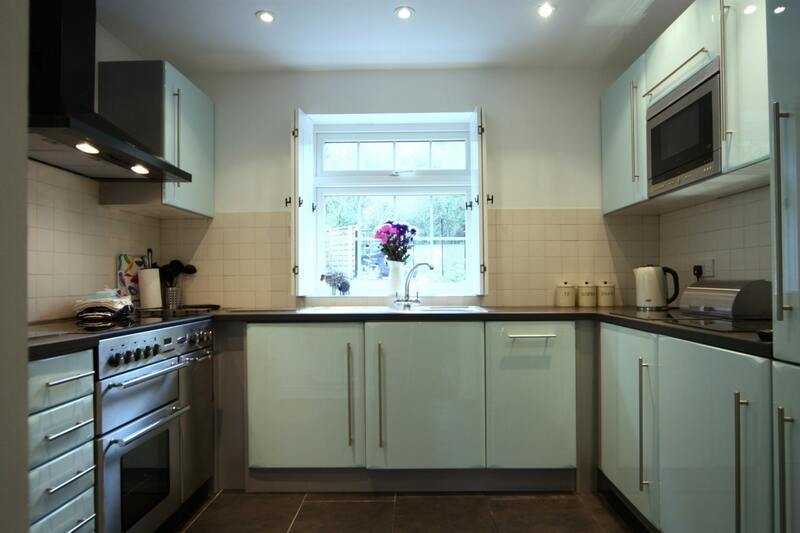 There is a very well equipped fitted kitchen, through an arch / open to the large dining area. There is a back door from the kitchen to outside . 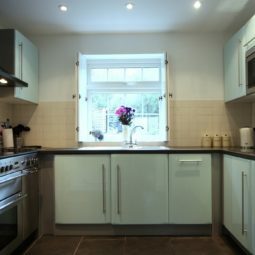 Also down stairs is one of the three bedrooms with its en suite. 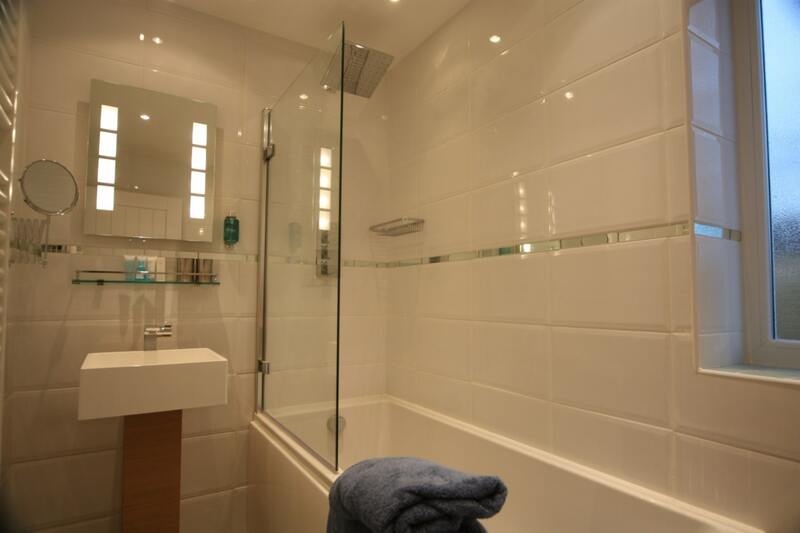 ( good shower over bath,dinner plate rain head) , WC and washbasin, shave socket, towel radiator. Accessed from the driveway is a lockable bike store which also houses our dustbins , barbecue and outdoor draught game. 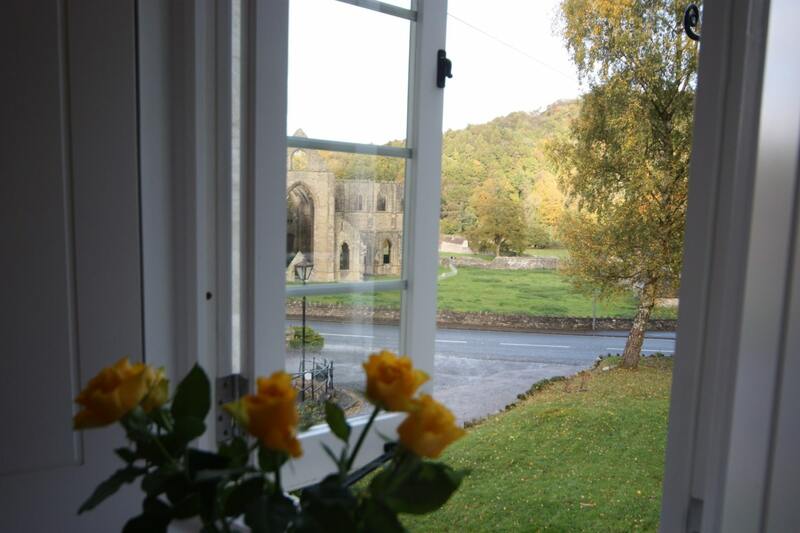 Upstairs there are 2 bedrooms, both with exceptional Abbey views,. When set up as doubles they have 6ft beds which can also be converted to pairs of 3ft twin beds. All bedrooms have their own radiators and TVs with DVD players radio alarms and ipod docks plus hairdryers, mirrors etc..
A travel cot is available on request and fits comfortably into the master bedroom ( It fits into the other upstairs bedroom but does not leave much access space) . We have hairdryers. The master bedroom has a safe. 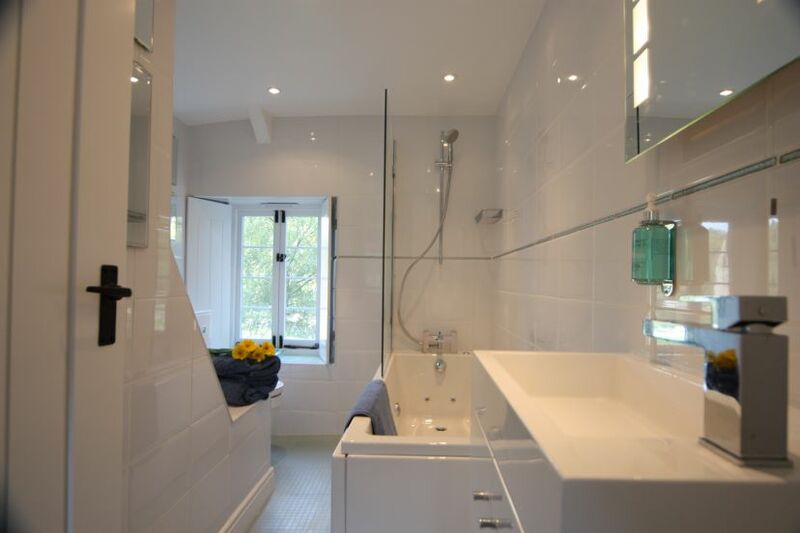 The upstairs bathroom is between the two bedrooms and has spa bathtub with shower over, ,WC,basin, shaver socket. towel radiator and of course Abbey views! 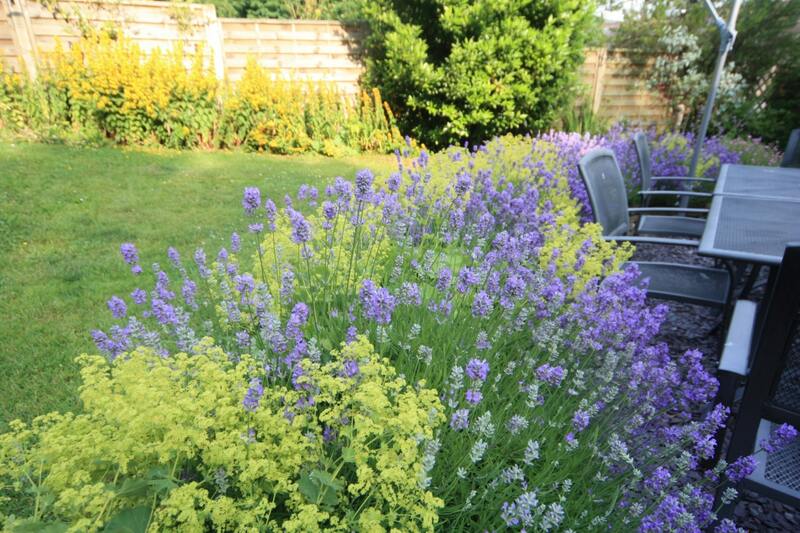 The pretty back garden with its lavender hedge is fenced and gated to be suitable for pets and children. There is a terrace with large table , brolly and chairs.there is low level lighting round the parking area. 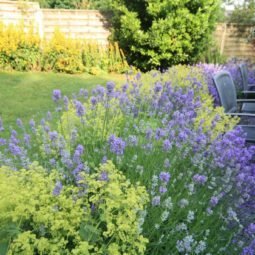 The front garden is much larger and is unfenced to make the most of the fabulous views. 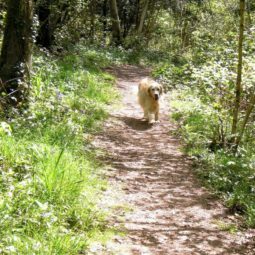 Children and pets are welcome there -but should be on a lead due to the drop to the drive and to the road. 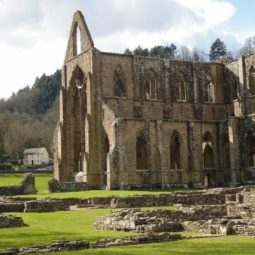 Adults will enjoy sitting watching the Abbey- especially in the late evenings when it is illuminated and the bustle of the day ends .We have a stone bench for the purpose! The off road car parking area has lighting. It now has room for three estate cars or four compact cars when very tightly packed.in. The more usual one or two visiting cars have plenty of space! Parking is at a premium in the village so this is valuable to our guests. 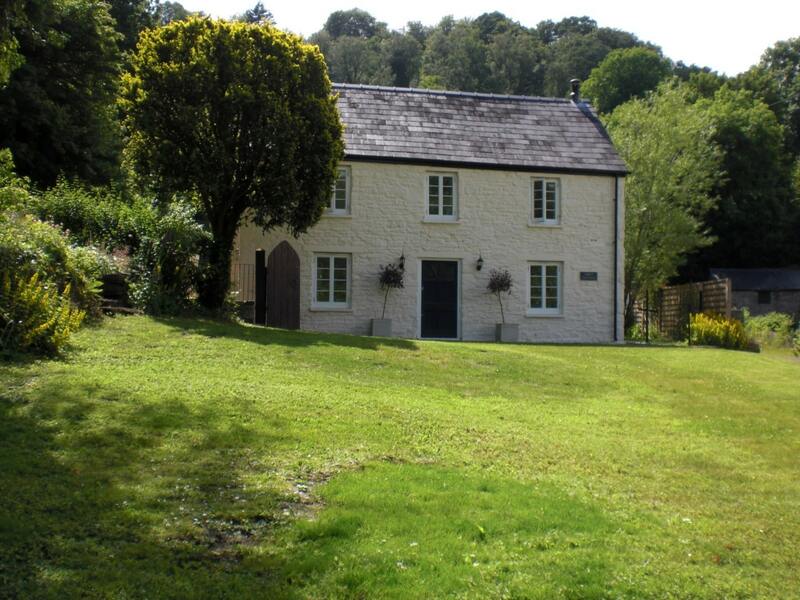 The cottage is easily reached, being in the conservation area of from historic Tintern , 10 minutes drive from both the Severn Bridge (M48) at Chepstow, and 15 mins from the dual carriageway north to M50 / M5 / M6 / M42 at Monmouth, making it a convenient choice all year round. 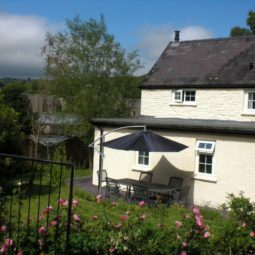 Winner of Best Place to Stay in Wales 2010 ( this award given only every 3 years) and our three cottages also won best Visitor Welcome 2015 and Best Self catering 2018. These awards are very much contested and winning once is special. Three awards….. 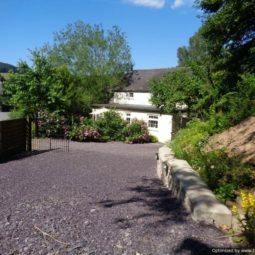 Awarded the coveted five stars for facilities and quality by Visit Wales, the owners also hold the “Croeso Cynnes Cymreig ( Warm Welsh Welcome) award .The cottage also holds awards for facilities for walkers and cyclists. 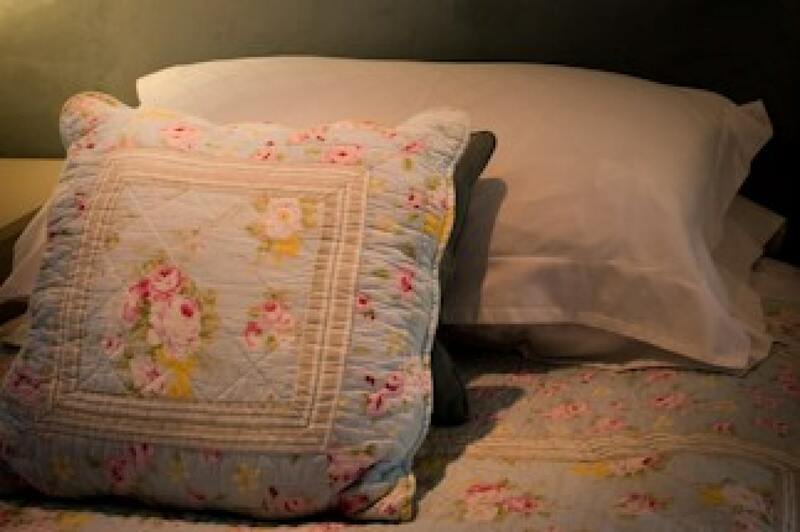 We have a beautician who will provide wonderfully relaxing pampering treats by appointment at the cottage. Indulge! Tesco, Sainsburys , Asda and Waitrose delivery services operate to the village. 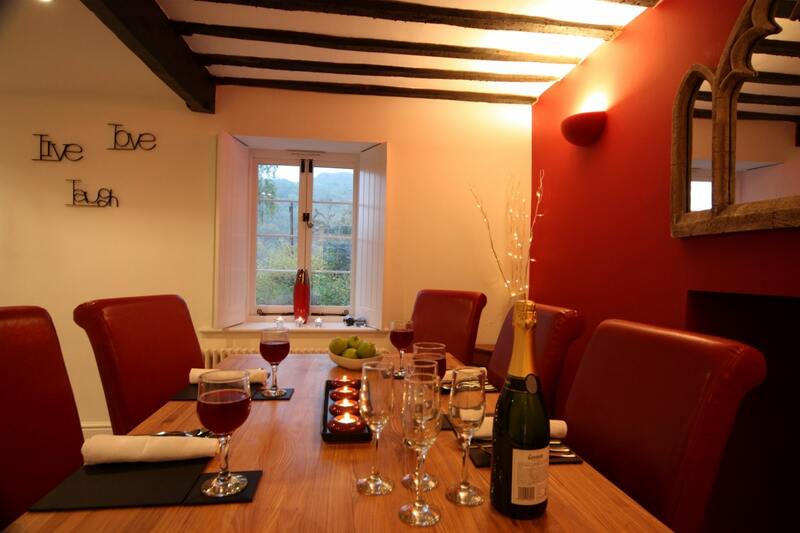 The Curry Queen is a local business which will cook to order and deliver fresh curries to the cottage on Friday evenings. Preorders only. Please ask. 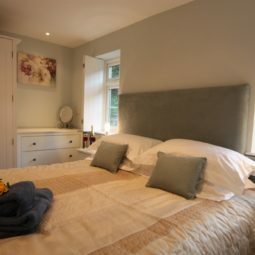 The cottage sleeps 6 and we have a travel cot and a highchair for a baby , a portable stair gate and a nursery fireguard ,plus we welcome pets. however we think that if you exceed 7 bodies ( adult child or pet bodies added together ) or bring a second travel cot you may feel a little cramped. The cottage is of cottage proportions and is not a modern large house. Please see the photographs. Space is particularly to be considered during the Christmas season when we also have a full sized Christmas tree. Very beautiful but also taking up space! We do not want you to feel squished. Green Business Tourism Scheme Gold award. 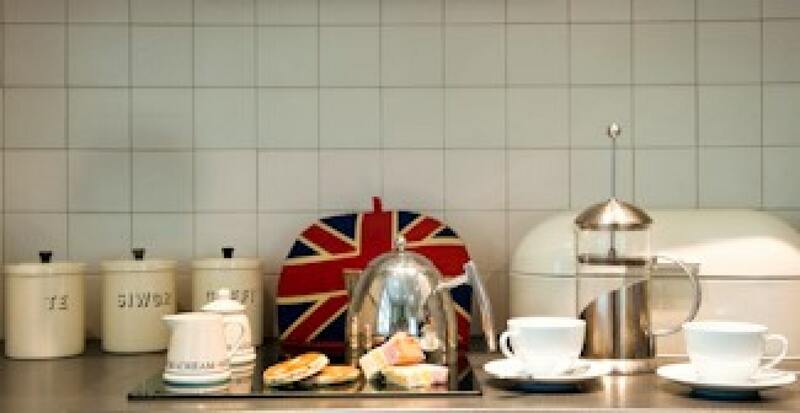 Please see the website section called “our Green Credentials “for fuller details).Renewed 2011,12 13 . 2014 For reasons of cost we no longer renew the badge but we have not dropped the highly green ethic..
We have green air source heating and we participate in the recycling scheme run by Monmouthshire County Council. 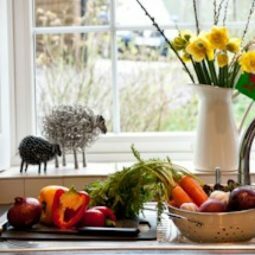 We are always happy to discuss any aspect of the cottage and its suitability for your holiday, and to describe the cottage and its features to you over the telephone. 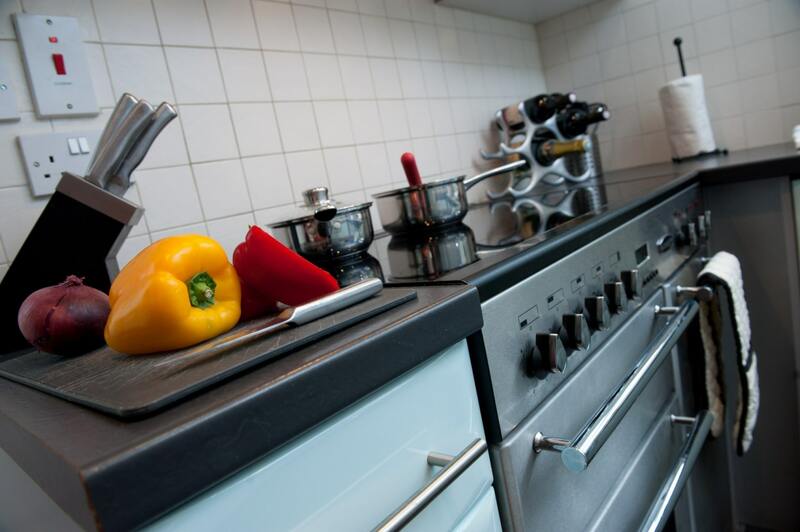 Please call us on 01600 860341 from within the UK or +44 1600 860341 from overseas. 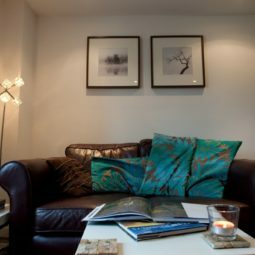 We can supply photographs of any aspect of the cottage on request if this assists you. This body of this document has been set in 14 pt using Arial as the type face. 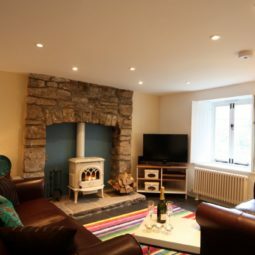 Inside the cottage, we maintain a visitors guide to the facilities, information about the locality as well as other important information including contact numbers for the local emergency services and hospitals. We welcome registered Assistance dogs free of charge and the information pack also includes contact details for local Vets with a 24hr service including callout. The old cottage building is unfortunately not wheelchair friendly. 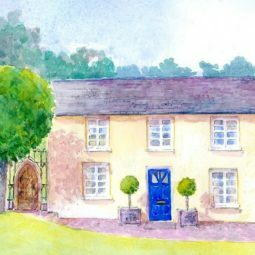 It is possible to enter the house from the parking area without using any steps by going via gently sloping grass lawns and along slate chipping paths but doors are not really wide enough for wheelchair access. 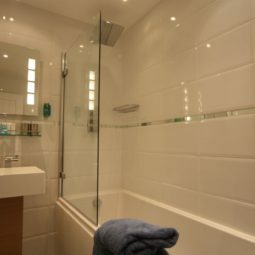 The ground floor can be used by people reliant upon zimmer frames but you may require assistance getting into and out of the bath / shower as the shower is over the bathtub. The bath is standard height. 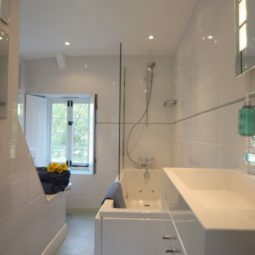 The space within the en suite bedroom between the end of the bed and the bathroom is not great but it is just possible to pass along to the bathroom with a zimmer frame. 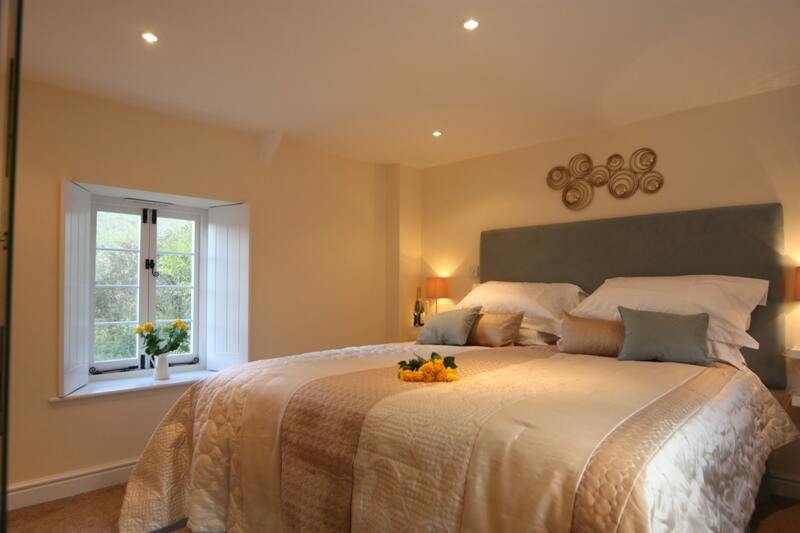 Beds can be repositioned on request and the room can be organised as a twin or as a superking double. There are no steps within the ground floor of the house . 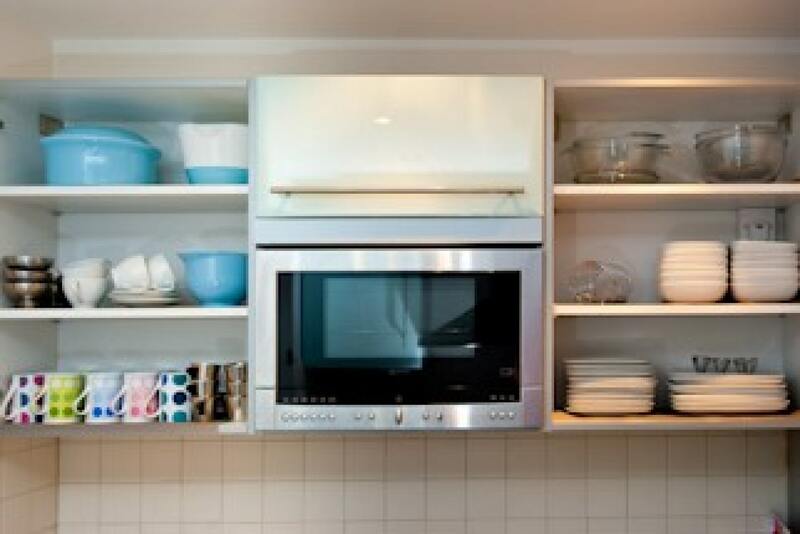 There is a small ramp kitchen to dining room and another from en suite bedroom to the dining room. These ramps are surfaced with the same porcelain tiles as the rest of the flooring. They are further painted with a slip resist treatment. Nevertheless like all hard floors they are inclined to be slippery and we recommend rubber soled slippers and not socks. They are however better for those with mobiliy problems than the step they each replaced. The paths throughout the property garden comprise a dense layer of slate chippings. Suitable for three family estate (eg VW Passat) cars or four very small cars. Slightly sloping surface covered with slate chippings. Lockable storage shed advertised for golf clubs and cycles is also available for wheelchairs and buggies. 4m from the bottom of the steps by the parking to the cottage back door step. PIR lighting to the steps. Door opened and closed by turning a knob. 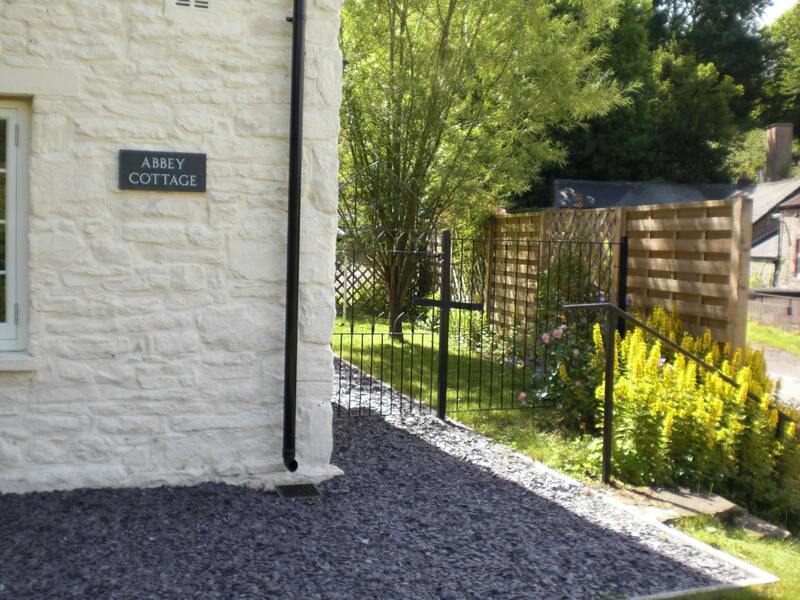 There is also a front door accessible from the parking by slate paths around the house and gently sloping lawns. This longer route ( approx 40 m ) avoids steps altogether. 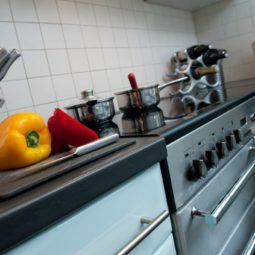 Independently controlled using twist thermostatic valve on each radiator. Wooden table and red leather padded chairs , booster cushions available. Landline telephone at extra cost on request. Ceiling mounted halogen bulbs Mood lighting from two floor /table lamps. Very variable lighting levels. Flooring black slate effect with colourful striped rug. Cooking knives located in a knife block on the work surface. Hard back chairs without armrests. A fixed retractable baby gate at the top of the stairs. Emergency lighting in event of power failure greenish light to stairs as emergency exit.